One can raise or lower the pitch detection range of both the lowest and highest pitches being processed in the APT and manual pitch editing functions. 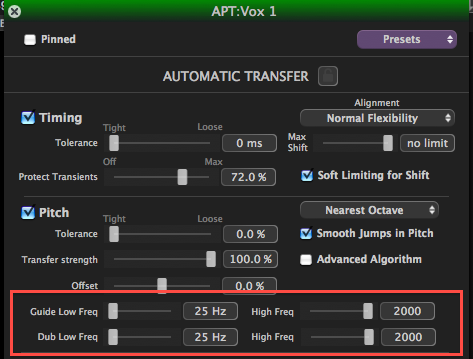 Adjusting the pitch detection range can make it possible to manually adjust or process the pitch of notes of voices and very low-pitched instruments (such as Bass guitars) or very high-pitched instruments such as flutes with extremely high quality. As shown inside the red highlight in the image above, for both the Guide and Dub signals, the lowest frequency the pitch detectors can be set to is 25 Hz and the highest frequency is 2000 Hz. Normally, only the low or high limits would be adjusted for a particular signal's range. For the manual pitch adjusting "trick", set both the Guide and Dub to the same limits. If the user wishes to visually set the low or high frequency limits, a graphical approach is described here. NOTE: Extending the pitch processing range from the defaults of 60Hz to 850Hz does increase the processing time as well as (in some cases) the chance for pitch measurement errors.